Candler’s Black Student Caucus will host its annual Heritage Week February 17-22, leading up to the 11th annual Heritage Ball. 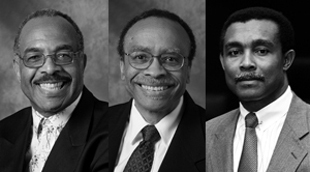 The ball supports the Erskine-Smith-Moseley Scholarship Endowment, which honors three of the school’s first African American faculty and provides students from Candler’s Black Church Studies program with scholarships and stipends to support their theological education. This year’s Heritage Ball will be held on February 22 from 7:00 to 11:00 p.m. at the Loft at Castleberry Hill, sister venue of historic Paschal's Restaurant. Register for the Heritage Ball. A video about the scholarship created by Carlton Mackey 05T will premiere at the ball. Watch a teaser above. Named for Noel Erskine, Luther E. Smith Jr., and Romney Moseley, three pioneer black scholars at Candler, the scholarship launched in 2014 and provides support for students during their ministerial education and pastoral leadership development. Erskine, professor of theology and ethics, has taught at Candler since 1977, and is a past recipient of the On Eagle’s Wings Teaching Award and Faculty Person of the Year Award. Smith, professor emeritus of church and community, retired in 2014 after 35 years on the faculty and numerous honors, including the 2010 Emory Williams Distinguished Teaching Award, Emory University’s highest award for excellence in teaching. Moseley, who passed away in 1992, joined the Candler faculty in 1982, and served as associate professor of theology and human development and assistant dean of academic affairs. This year’s Heritage Week theme is “Deeply Rooted.” Newsome calls it “a week of reflection, service, and celebration. It’s a snapshot of all the ways black faculty, students, staff, and alumni contribute to the Candler community.” A video created by Candler alumnus Carlton Mackey 05T, director of the Ethics and the Arts Program at Emory's Center for Ethics, honors the legacy and looks to the future of the Erskine-Smith-Moseley Scholarship. View the teaser above. The full video will debut at the Heritage Ball. View the 2019 Heritage Week schedule below. February 17: Community Church Service, 10:30 a.m.-12:30 p.m.
Candler students, faculty, staff, and alumni are invited to worship at Trinity AME Church. Senior Pastor Conitras M. Houston 08T will deliver the sermon. Trinity AME Church is located at 604 Lynhurst Drive SW, Atlanta, GA 30311. February 18: Community Blood Drive, 9:30 a.m.-3:30 p.m.
Candler students, faculty, staff, and alumni are invited to take part in a blood drive in the Candler atrium. February 19: Service of Word and Table, 11:05 a.m.-12:00 p.m.
Natosha Reid Rice, associate pastor of women’s ministries at Ebenezer Baptist Church and associate general counsel for real estate and finance at Habitat for Humanity International, will preach and preside at Candler’s worship service in Cannon Chapel. A lunch with Rice will follow in Room 322 of Candler's Rita Anne Rollins Building. February 21: Service of Word, 11:05 a.m.-12:00 p.m.
Eldren Morrison, senior pastor of Shaw Temple AME Zion Church, will preach at Candler’s worship service in Cannon Chapel. February 21: Black Alumni Caucus Student/Alumni Mixer, 6:30-8:30 p.m.
Candler’s Black Alumni Caucus invites black alumni and current students to an evening of food and meaningful conversation in the Living Room of Emory's Oxford Road Building. Register here. For more information, contact candleralum@emory.edu. The Oxford Road Building is located on the campus of Emory University, at 1390 Oxford Road NE, Atlanta, GA 30322. February 22: 11th Annual Heritage Ball, 7:00-11:00 p.m.
Candler’s Black Student Caucus invites students, alumni, faculty and staff to attend this year’s Heritage Ball at the Loft at Castleberry Hill (sister venue of Paschal's Restaurant) and celebrate the legacy and future of the Erskine-Smith-Moseley Scholarship. Ticket/table purchase includes admission, food, and beverage. Individual tickets are $40/person, and a table of 10 is $350. Register here. The Loft at Castleberry Hill is located at 170 Northside Drive SW, Suite 96 Atlanta, GA 30313.